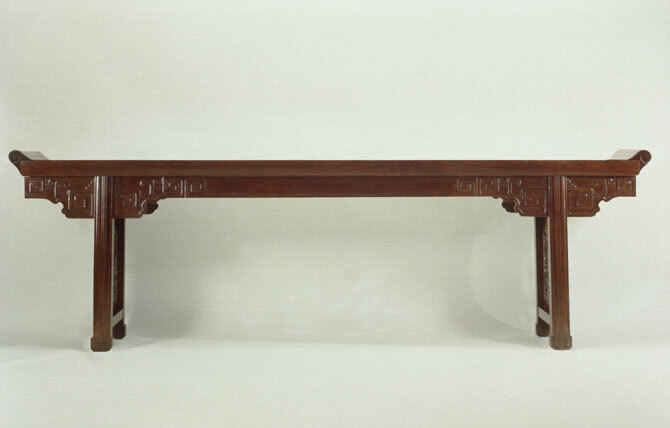 Please compare our piece with two magnificent solid top huanghuali wood Side or Altar Tables originally in the holdings of Ming Furniture Ltd. which can now be found in The Chinese Rooms at The Minneapolis Institute of Arts (149.5 in., 380 cm.) and The Metropolitan Museum of Art, New York (114 in., 285 cm.). 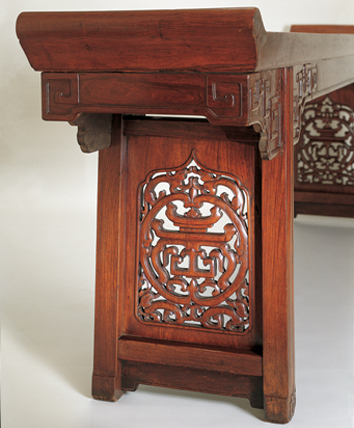 In Ming Furniture In The Light Of Chinese Architecture on pages 145 and 146, Dr. Sarah Handler writes: “The long huanghuali side table with shou characters, fashioned from thick pieces of wood and massively proportioned, would have been perfect for an open room since the back is finished with as much care and detail as the front. The extraordinary top consists of a single piece of boldly figured huanghuali that is just over three inches thick and finished with rounded, scroll-form everted flanges. The heavy top is supported on thick legs that in a rare variation of the standard form are enlarged, rather than flared, at the foot. A double row of beading in the center of each leg divides into angular spirals at the foot and continues as a single bead along the edge. The spandrels are carved with wide, flat angular scrolls arranged in reversed symmetry on each side of the leg. The thick openwork side panels are each carved with a single large shou longevity character within a roundel resting on the backs of two small dragons. Another pair of dragons touches noses at the top of the roundel. Beautifully carved and powerful in design, all the decoration on this table harmonizes with the heavy solidity of its form.